Engagement rings with white gem are always preferred, yet it actually will look better if you choose a ring with a non-white gem. Darker colors will be more easy to pop out and absorb other people’s attention. Plain design, less decoration and clean lines will highlight the gem on the ring while giving the engagement ring an elegant and modern style. Maybe you can refer to the solitaire engagement rings, no matter what color the gem is, all they have the superior effect. An old saying goes: There is no absolute, only relative in the world. The same sentence could be used to describe the size of gems. If you are not satisfied with the size of the gem on your engagement ring, try to consider the side stones rings. Gems with Halo appear more attractive and shining than others. 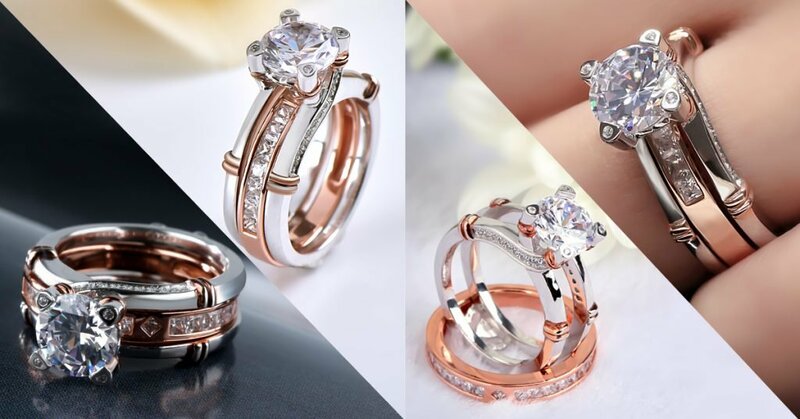 For example, the central stone of Halo White Sapphire Ring is in the same size with Princess Cut White Sapphire Ring; yet it is obvious that the former looks more gorgeous and sparkling than the latter. The fact is, no matter what kind of ring you wear, all need to be cleaned every once in a while. A ring, like White Sapphire Ring, will be always stunning, but it will surely be much more impressive once been properly cleaned. Your style is really unique compared to other people I have read stuff from. Thanks for posting when you’ve got the opportunity, Guess I will just book mark this page.